COLLINGWOOD, Ont. – Veronica Onyskiw woke up to the sound of her dog growling and a loud noise like a revving engine coming from outside her Collingwod, Ont., home early in the morning last Sunday. 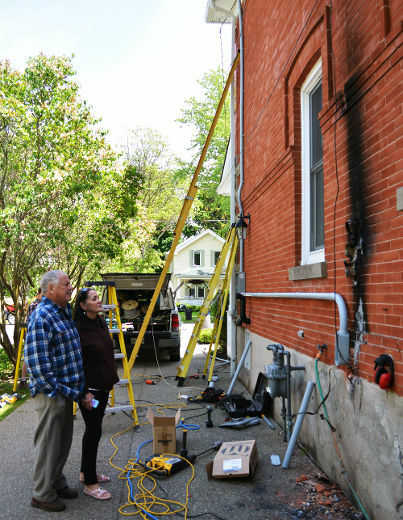 Thousands of smart meters attached to homes across the province were ordered removed earlier this year after similarities were found between the structure of those meters and a similar model used in Saskatchewan that was implicated in several fires in that province. Onyskiw’s meter was not among those considered a fire threat. Larry Irwin, the vice-president of the local utility — Collus PowerStream — said the company has never used those meters. Onyskiw said she has been told that the way in which the meter was installed on her home might be to blame. If that’s the case, it’s just as much cause for alarm, she said. In her case, firefighters put out the flames, and nobody was injured and there was no structural damage. But a happy ending might not be repeated for the next person. Collus said it is investigating. Smart meters have been the target of criticism since the province ordered them installed on homes across Ontario several years ago. In a December report, the auditor general found the $1.9-billion rollout cost has not led to the expected savings to customers. A Hydro One sale will likely kill a planned review of the program. This entry was posted in Uncategorized and tagged explosion, fire, Ontario. Bookmark the permalink.